When you print a document of Word to PDF format, do you want to save toner in the printing process? If you do, you can use the application Document Converter as your helper for there is a virtual printer application designed for saving your printer toner, also your paper. 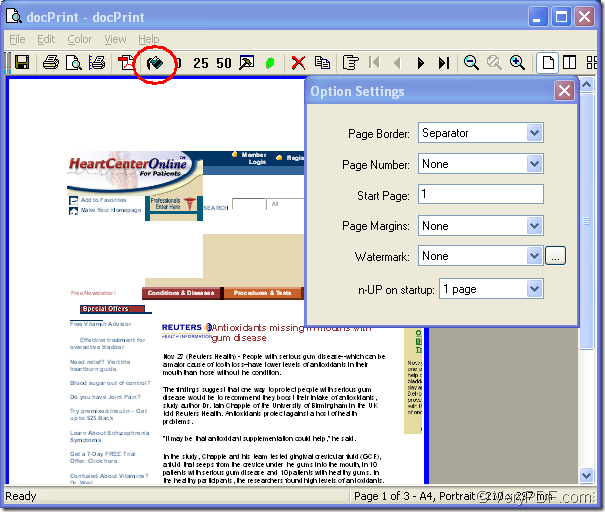 The name of the virtual printer application is docPrint. It is powerful enough because it is not only a Windows printer which can save toner for the printer, it is also a document converter which is able to convert any printable document to many kinds of image formats. So using it to save printer toner is a good choice. There are also two other applications in Document Converter—GUI application and command line application. With GUI application, you can make convert documents to images more conveniently; With command line application, the software developer may get an excellent helper. Please open the Word document and click “File”—“Print” or use the hot key “Ctrl”+ “P” to open the “Print” dialog box in which you should choose docPrint as the current printer in “Printer” combo box. Then please click on “Print” button. If you have set docPrint as the default printer, you can right click the Word document and choose “Print” option in the dropdown list to run docPrint directly instead of opening the file. 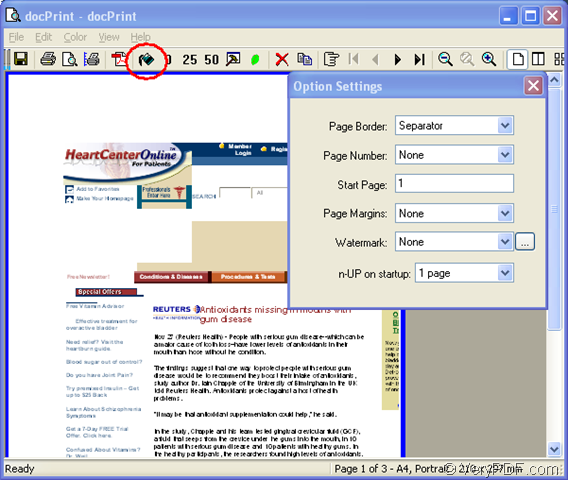 Please see the docPrint main window in Figure1 and you will see there are several function buttons in the toolbar and a small dialog box on the right. 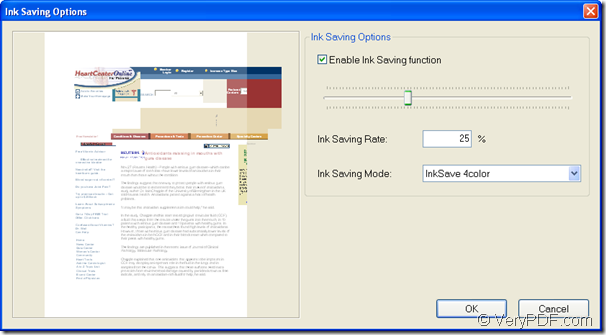 By clicking on the button framed in the toolbar, you can see “Ink Saving Options” dialog box in which you can set some parameters to save toner. Please see “Ink Saving Options” dialog box in Figure2. You need to check “Enable Ink Saving function” option to make the all the functions below available. In “Ink Saving Rate” edit box, you can input the saving rate. In “Ink Saving Mode” combo box, you can choose four kinds of modes according to your need. Then please click on “OK” button. Please click the “Save File” button which looks like a floppy disk in the toolbar or use the hot key “Ctrl”+ “S” to open the “Save As” dialog box to save the target file. Please see the “Save As” dialog box in Figure3. 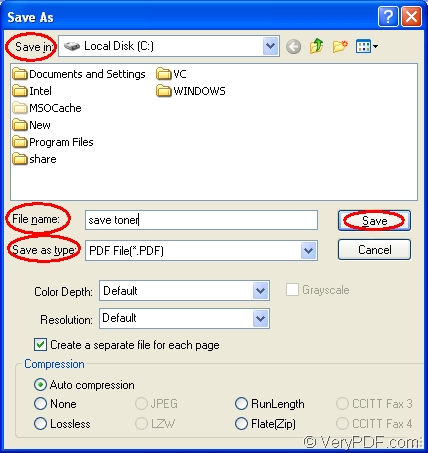 Please choose the location for the target file in “Save in” combo box, input the name for the target file in “File name” edit box. 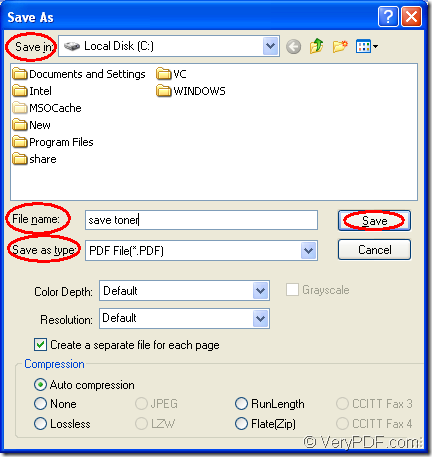 Please select the output format for the target file in “Save as type” combo box and then please click on “Save” button. Several seconds later, you will get the new target and the printer toner has been saved successfully. How to annotate PDF by free online annotator? How to annotate PDF in iPad? How to use appending and inserting feature in PDF Printer?